The Beginning of February marks the season of love. Its the season when all couples forget about the little fights and stat thinking if what to gift their partners,how to celebrate and what to were. 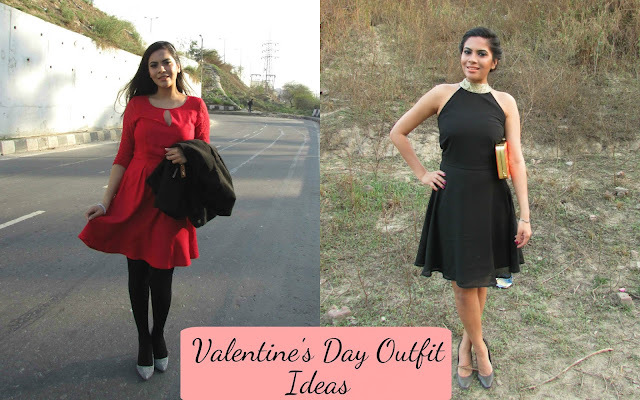 Here are two Valentine's Day Outfit Ideas from last year. These are valentines day out outfit and Valentine's Night Out Outfit. I think by now everybody here know that I am single, but ofcouse I like to take the advantage of the day to dress all girly. I am not a person who goes ga-ga over Valentine's Day, I am kind of neutral, its just another reason to dress up, eat good food and open presents. Talking of occasion, the first thing that comes to our mind is 'ok,so what am I wearing' ! These are two completely different outfits , one a cute day glam winter outfit and another a classy night outfit. 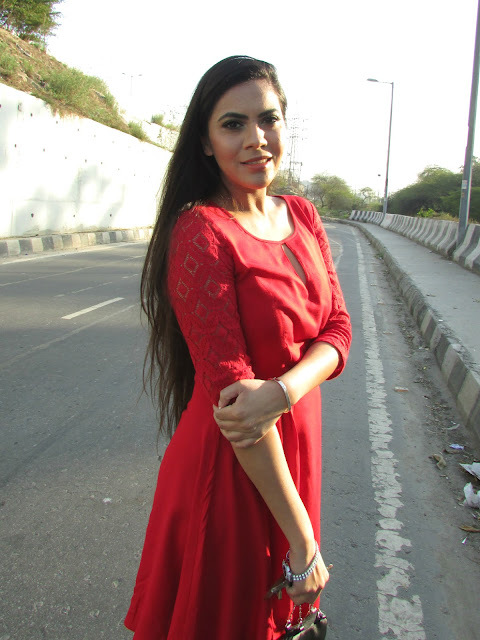 Valentines Day Out Outfit: The first thing that comes to our mind when we think of Valentines day is red, so here is a little red dress for all the red lovers. To go with the dress I added a jewelled headband , silver pumps and there you have your lunch date outfit. Valentines Day Out Outfit: Now to a night out outfit. When I think of Valentine night out , I think of a quite romantic dinner. 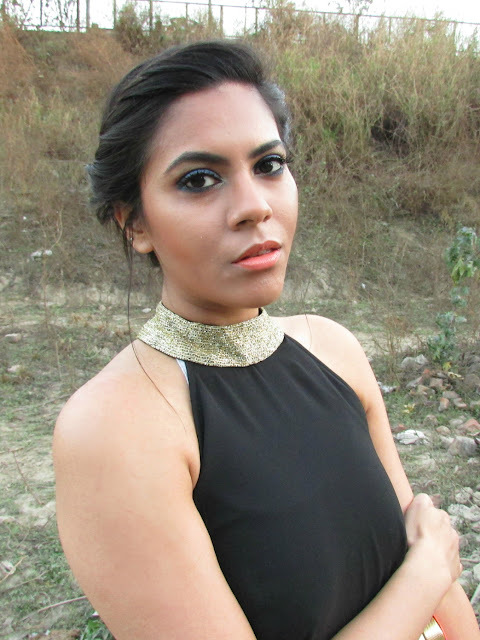 This Little black dress with gold embroidery is just perfect to keep to classy and girly while you spend time with your love. There are my Valentine outfits, don't know what I am doing this Valentines but I am surely going to find a cute dress and then find a place to go to wearing it. 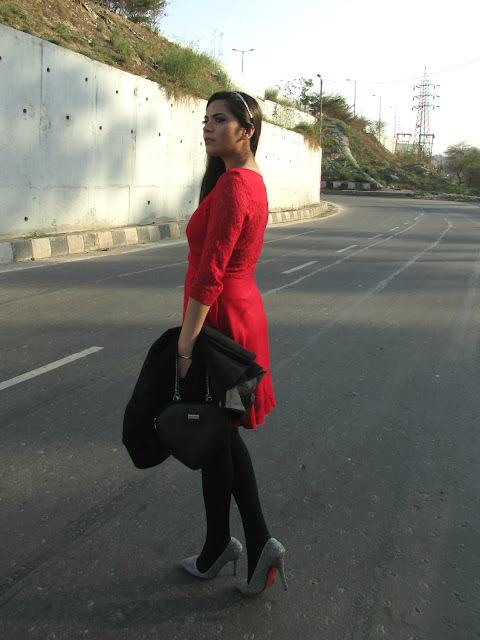 Which one did u like better, red dress for day time Valentine outfit or LBD for night out ! Very elegant looks, warm greetings! Belli tutti e due preferisco il rosso. Red dress is so pretty! These dresses look amazing on you! I love them for Valentine's Day! Looking pretty as usual Pooja! Red is my fav! International Saree Giveaway on my blog! Nice post! Love these photos! Looking gorgeous in both but I love the black outfit more!! Beautiful looks! The first is my favourite! Dear Pooja, your outfit ideas are so good and you look adorable and absolutely beautiful! So pretty. I especially love red for Valentine's Day and the lace is beautiful. Luv how you styled it!! Those silver pumps are my fav now..